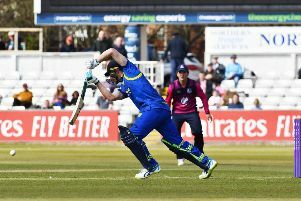 A career-best performance by England fast bowler Mark Wood was not enough to give Durham victory as Derbyshire held out for a draw in the Division Two match at Derby. Wood showed he is ready for next week’s first Test against Pakistan by taking 6-46 in 23 overs, but determined batting from Derbyshire’s lower order kept Durham at bay. After wicketkeeper Daryn Smit batted 80 minutes for 34, Tony Palladino and Ravi Rampaul dug in for nine overs to take Derbyshire to 279-9 - a lead of 186 - when the players shook hands at 5.05pm. Wood made the first breakthrough when Luis Reece chopped onto his stumps in the 12th over of the day. Ben Slater and Wayne Madsen added 55 but Wood removed them both in consecutive overs. Madsen was unable to avoid a lifting delivery and was caught behind for 32 and Slater was smartly snared at short leg for 42 with Derbyshire only four runs in front. A good morning for Durham got even better when Alex Hughes tried to leave a ball from Cameron Steel and was caught behind to leave Derbyshire just 21 ahead at the interval. Durham were frustrated after lunch as Billy Godleman and Matt Critchley added 63 in 17 overs until Steel had Critchley caught behind for 40 and James Weighell moved one away in the next over to have Godleman taken at first slip. Hardus Viljoen dispatched Steel over wide long on for six but when Wood was recalled, he edged a drive to second slip and the fast bowler celebrated his fifth wicket after tea when Smit pushed at one and was well caught by Stuart Poynter. Duanne Olivier was caught behind for his fourth duck in five innings but with Wood visibly tiring, Palladino and Rampaul added 37 runs to dash Durham’s hopes.